Introduction: There are two sources of pollution: point source (PS) and non-point (NPS) pollution. 80% marine pollution comes from the land. NPS is considered one of the largest source of pollution which accrues as a result of agricultural runoff. Point Source: Sources of pollution that directly pollutes the water. Examples include: septic tanks, cars, boats, etc. Non-Point Source: Sources of pollution that indirectly pollutes the water. Examples include, urban agricultural lands, etc. According to the EPA Victoria, there are two types of pollution sources, the point and nonpoint. The point source pollution is defined as a single source of pollution that runoff from a pipe or a drain to the sea or ocean. Besides, the federal and the state require businesses, cities, or industries to have limited permit of allowing pollutants pipes and drains. However, the cost of protecting this pollution is costly and the EPA is trying to create regulation that best preventing pollutants to the sea and ocean. On the other hand, the nonpoint source pollution is defined as a result of runoff from urban land use, agricultural land use, and forestry land use. In urban area, storm water such as rainfall is a major pollution because it affects the water quality of the water ways and bays. Despites this, the storm water can carry car oil and chemicals from constructions site to the sea or ocean. When this occurs, it can affect the aquatic species and impact human health. As the world’s population growth increase and technology continues to spread worldwide, the navigation of the ocean has become a shipping route and dumping ground for human activities. The continuations of human activities deplete biodiversity and disrupt the natural ecosystem in the ocean. According to the Science Learning, wasting such as chemical, sewage, and industrial run-off have a big problem worldwide. Besides that, a country’s without strong government to enforce existence policies, the chance of protecting and conserving ocean ecosystem seem slim. In addition to that, as countries continue to pursue economic growth, the release of carbon dioxide cause the ocean to become more acidic and warmer. Two type of sources cause pollution for the ocean are the point source pollution and nonpoint source pollution. The point source usually come from the run-off such as “septic tanks, cars, trucks, and boats, plus larger sources, such as farms, livestock ranches, and timber harvest areas” (National Oceanic Atmospheric Administration 2011). This source has negative impact on the economic especially cities that are located along the coast. For example, the U.S Coastal and marine water support 28.3 million jobs, generate $54 billion in goods and services, and contribute $30 billion for recreational fishing. With the run-off causing dirty-looking water and die-off fishes can have financial loss for investors and workers. Overall, this can be concluding that nonpoint source pollution does not only affect the ecosystem but also the economy as well. On the other hand, the nonpoint source pollution is usually factories and sewage treatment plants. With unregulated discharge can result in unsafe drinking and lead to restrict activities such as fishing and swimming. It can also cause damage to human health and the environment when sewage plants go untreated (National Oceanic Atmospheric Administration 2011). Nutrients and algal blooms can be a problem. With overabundant nutrients such as nitrogen and phosphorus in the ocean can also affect the living organism and overgrowth of algae. Marine debris is also harmful to the ocean because it “injures and kills marine life, interferes with navigation safety, and poses a threat to human health” (National Oceanic Atmospheric Administration 2011). This impact the fisheries industries since heavy metal and other contaminants make it harmful for people to eat. With all of this pollution, education may play a big role to help decrease pollution. While pollution caused by oils, land run off, and sewage are bad, there is another pollution which is plastic pollution. Plastic pollution covers about 40% of the world's ocean surfaces (Hasselberger). The problem with this is that when the plastic disintegrates and breaks in to smaller pieces it sinks in to the ocean depths. Then the smaller toxic pieces of plastic are ingested by sea life causing them much harm and death. Around 80% of the pollution in our ocean is found from land, with most of it being from plastic, one of the many materials involved in littering by humans. Other land-related sources of ocean pollution can mainly be traced back to sewage, toxic chemicals from industries, and oil spills. Littering occurs when objects that are far inland are blown into the ocean over long distances. These objects include anything from sand and dust, but mainly man-made materials such as debris and trash. This trash is mainly consisted of plastics, which essentially do not degrade. When plastics end up in the ocean, 70% of that gets deposited into the deep ocean. Animals that mistake these objects as food are killed, while other animals end up getting snagged and die rather slowly. As the global demand for oil increases, the more amount of oil we’re bringing into the oceans increases as well. 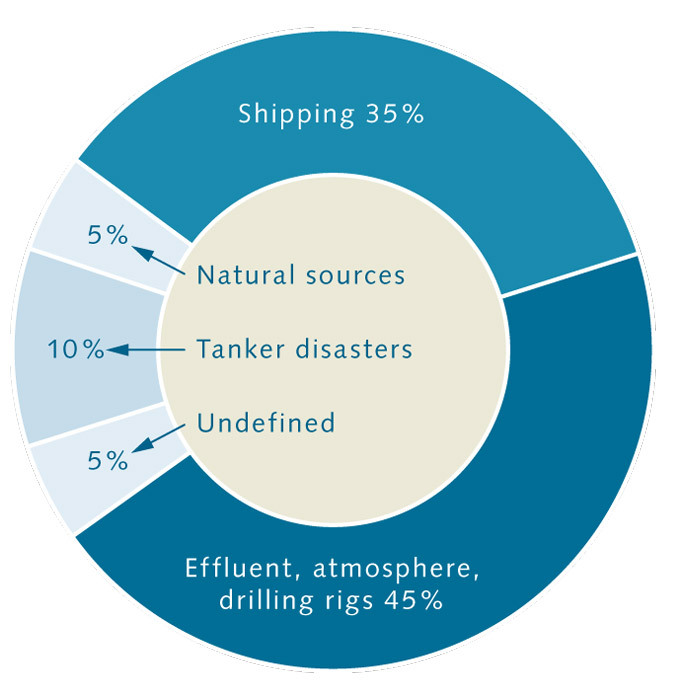 As another major source of pollution, oil can spill into the ocean in a variety of ways—natural sources, from shipping operations, with a majority of oil pollution coming from drilling rigs (this image shows the sources of oil pollution: http://worldoceanreview.com/en/files...betrieb_en.jpg). This crude oil consists of around 10,000 individual substances, including heavy metals and nitrogen compounds, and is extremely toxic to marine animals. One of the largest oil spills recorded in history was the oil spill from the Deepwater Horizon in April 2010. Since it is extremely difficult to clean up oil spills, it can remain in the sea for years and provide devastating effects for our marine environment.